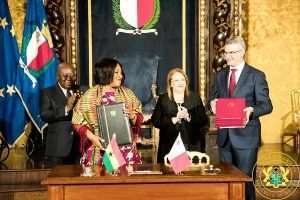 The Ministry of Foreign Affairs and Regional Integration has refuted some media publications about a supposed visa waiver deal signed between Ghana and Malta during a Government delegation visit to the European country. Explaining what really transpired, the Foreign Affairs Ministry explained that the visa waiver agreement deal does not extend to the general public but rather only applies to holders of diplomatic and service passports on official duties. The press release from the Ministry of Foreign Affairs also indicated that the agreement will come into force after both countries have been notified on the existing national legal procedures involved. Media houses may wish to contact the Ministry of Foreign Affairs And Regional Integration for further clarification on the Agreements and Memoranda of understanding, if necessary. President Nana Akufo-Addo on 25th March, 2019, left Ghana for a 1-day official visit to Malta, at the invitation of Malta’s President, Marie-Louise Coleiro Preca, who was one of the first foreign leaders to pay an official visit to Ghana, under the Akufo-Addo presidency, on 26th July 2017. The reciprocal visit was aimed at deepening and strengthening the ties that exist between the two countries, as well as exploring other areas of co-operation for the mutual benefit of the countries. The President was accompanied by the Minister for Foreign Affairs, Shirley Ayorkor Botchwey, the Minister for Trade and Industry, Alan Kyerematen, and other officials of the Presidency and Foreign Ministry.